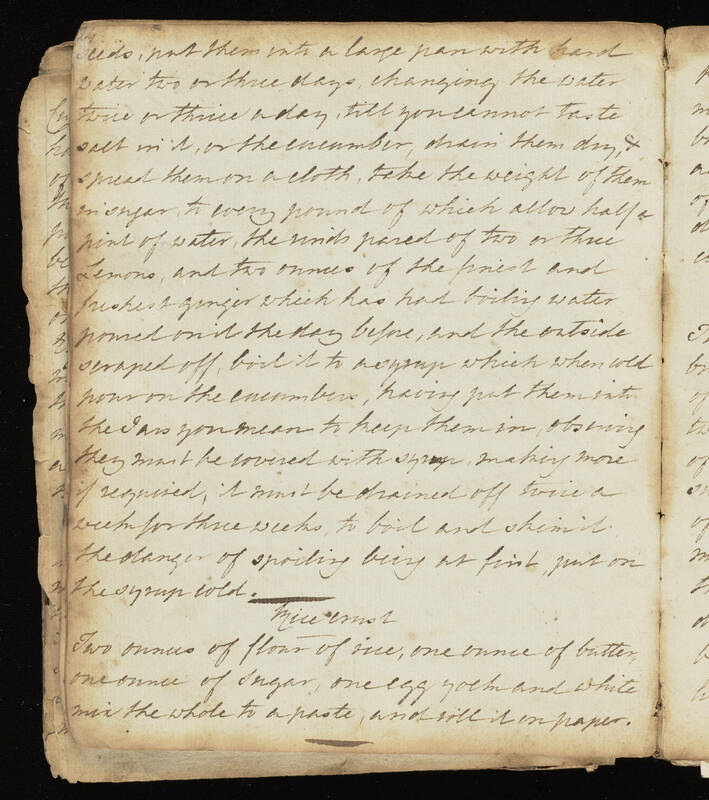 24 seeds, put them into a large pan with hard water two or three days, changing the water twice or thrice a day, till you cannot taste salt in it, or the the cucumber, drain them dry, & spread them on a cloth, take the weight of them in sugar, to every pound of which allow half a pint of water, the rinds pared of two or three Lemons, and two ounces of the finest and freshest ginger which has had boiling water poured on it the day before, and the outside scraped off, boil it to a syrup which when cold pour on the cucumbers, having put them into the Jars you mean to keep them in, observing they must be covered with syrup, making more if required, it must be drained off twice a week for three weeks to boil and skim it. the danger of spoiling being at first, put on the syrup cold. Rice crust Two ounces of flour of rice, on ounce of butter one ounce of Sugar, one egg yolk and white mix the whole to a paste, and roll it on paper.